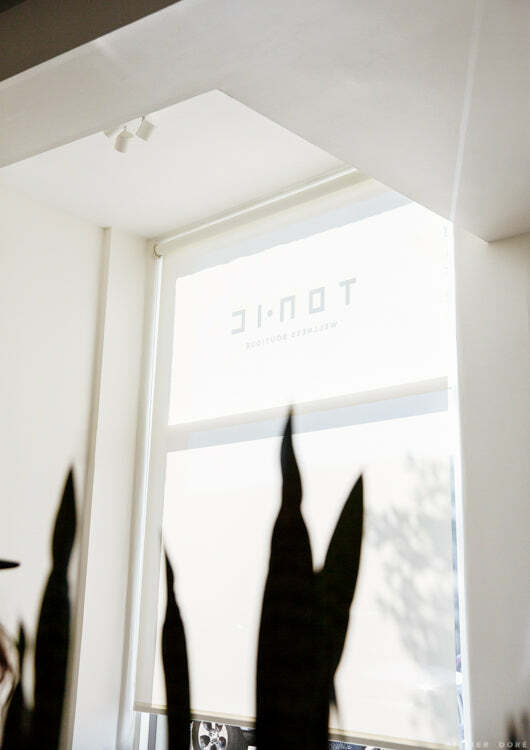 Garance has been raving about Posetta and The Signature treatment at Tonic Boutique in Los Angeles for some time now. Beyond being the owner of Tonic Boutique, Posetta is also a board-certified life coach, board-certified hypnotherapist and Institute of Integrative Nutrition Health coach. Her want for healing, and well being drove her to found Tonic Boutique. There you can participate in cryotherapy, infrared sauna with Rejuvenating LED Light in addition to life and health coaching sessions along with guided meditation so you walk out of there light in mind and body. I started being interested in human health and how to feel our best every single day. I suffered from a dislocated hip at a young age. Growing up was a different experience for me – I didn’t get to have most of my teenage years as a normal teenager because I was either in bed or recovering from surgery. Then I had to deal with the death of my father at the same time. I was aware from a very young age that there was more to life than waking up and going to school and dealing with high-school drama. But I’m very grateful for that experience because I think when you’re young you don’t understand that there are a lot of people suffering and fighting for their life. It definitely makes you appreciate things differently, like your family, friends, health, your body. I believe trauma and inflammation are the root causes of many ailments and unhealthy lifestyles. It doesn’t have to be that you suffered from a bad childhood or something happened to you. Sometimes you are traumatized by being a perfect kid growing up. Things happen to your mind and body and going into the sauna and having a peaceful 20 minutes for yourself, you’ll be releasing a lot of mental and physical toxins from your body. I became a certified hypnotherapist for meditation because this is what grounds me. Without your second breath, there is nothing that you can accomplish. Deep breathing, guided meditation. What I call life and health coaching, in my practice, is geared in a way that we always add and subtract every single program for your kind of lifestyle choices, and we look at your habits and then we decide together what is the best way for you to go. We generally do six months or a year, and then we see you in the following year. We are always growing and we are always changing. You cannot put your health and your life in one box and say This is the program I’m going to go for the rest of my life. I’m very devoted to my coaching practice because my program helps me to be everyday more compassionate. Especially when you’re hearing a lot of stories and the power of human beings. We always want to evolve in so many aspects, whether it’s emotional, or changing your career. A lot of the times, it’s about fighting a disease, which I find very grounding. Whether someone is coming to just relax or someone is fighting an autoimmune disease, the energy is positive and it’s full of growth. I came up with the idea of having a place where I can have all of these treatments outside my practice. When I moved to LA four years ago, I figured this was the place to have a tiny wellness boutique to bring people to experience this treatment I call The Signature. It’s three minutes of cryotherapy, twenty minutes of lymphatic massage and compression, also known as Pressotherapy and then an infrared sauna session. Ours is a three-light sauna, one of the latest versions of infrared saunas out there right now. This heats your body from the inside and you start sweating and getting rid of toxins and heavy metals, which gives you a great glow and burns calories. Every light works on something in your body, whether taking impurities from your blood or just relaxing your nervous system. Through the light, with the heat, I believe this is the best detoxification system out there. If you work out, you sweat. But that sweat is not detoxing because you’re under stress. When you work out, you break down your body and muscles to make it stronger. When you’re on a diet or on a cleanse (though I hate the word diet), you deprive your body because it is also under stress. But when you go in the sauna, light therapy is going to help you calm down your nerves and make you feel safe, so you’re not in fight or flight mode. And then you start releasing all of the toxins in your lymphatic system or kidneys or liver and your overall body. If you do the Signature, the cryotherapy will substitute the cup of coffee that you need. It will release happy hormones, which are serotonin, dopamine, or oxytocin. It’s a great way to boost blood circulation and reset your entire system. When you are at that temperature, all your blood goes to your gut, and there are a lot of nutrients and oxygen trapped in your gut. When you get out of the chamber, you feel a tingling sensation, and that tingling is the blood going back everywhere. But now this blood is fully oxygenated and nutrient-dense. Even if you eat the best, most organic vegetables out there or grass-fed meat, there are still toxins in the air you breath. There are still toxins by having your phone around you. You receive stressful information. When you are stressed you are hoarding toxins. I don’t believe if you are on a diet or you are working out that you are going to release that. You do release endorphins, which help inflammation. But once a week, going into a sauna and getting all that out, rejuvenating, you are going to see your health on a much different scale in terms of peace and serenity than other therapies out there. You can learn more about Posetta and Tonic Boutique here! Ok, I get that we’re very into the LA lifestyle here now. And I always support lady-owned businesses. If saunas bring you peace and happiness, you totally do you! And there are definitely health benefits to them. But, you guys, you need to provide factual backup for statements like this. Or a disclaimer at the bottom of your posts. Or, better yet, notes from a scientist or doctor who have done peer-reviewed research into these topics. Because people trust you and you’re presenting the above as expert fact. And that’s a little scary. The idea that sweating while working out is not “detoxing” (what does that even mean?) because your body is under stress (wut…?) or that you have an article about “detoxing” that only mentions the liver once in paragraph nine (9!! How rude, considering it’s dealt with your ladies wine nights and ~experimental years~ in college and thus kept you, y’know, alive). It’s great that we are talking about wellness as a key factor of our health, but we need to keep that rooted in legitimate research. And should really include safety precautions, such as consulting your doctor if you have heart conditions or are pregnant. This sounds relaxing and is probably great for circulation, but I was wondering if you have any research backing up the claim that you can sweat out toxins. Scientists seem to agree that it’s a myth (here’s a National Geographic article on it: https://news.nationalgeographic.com/2018/04/sweating-toxins-myth-detox-facts-saunas-pollutants-science/), so I was wondering what your sources are for these statements.